I presented this poster on October 25, 2010 at the Library Assessment Conference in Baltimore, MD. 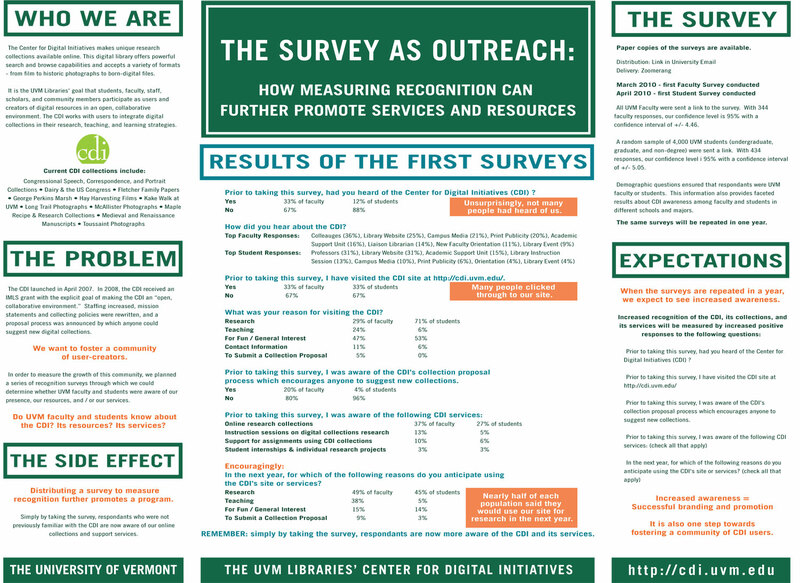 To gauge the success of CDI publicity and outreach efforts, I conducted surveys measuring recognition of the CDI’s resources and services among various on-campus target audiences. The surveys will be repeated annually. At each interval, we hope to see increased recognition and use of our resources and services. The Recognition Surveys simultaneously function as an outreach tool in and of themselves; by taking this survey, people previously unfamiliar with our resources and services were made aware of what the CDI can offer. Read the full abstract. Katz, Robin M. “The Survey as Outreach: Measuring Recognition Can Further Promote Resources and Services.” Library Assessment Conference. Baltimore, MD. October 29 – 31, 2010. Poster.